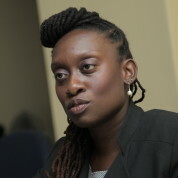 Jacqueline Muna Musiitwa, Esq. is the Founder and Managing Partner of Hoja Law Group, a boutique legal consultancy based that represents clients in corporate governance, commercial and public law matters. Hoja Law Group also advises investors investing in Africa and African businesses contracting with foreign businesses. Jacqueline has served as Legal Counsel and Assistant to the CEO and President of the Eastern and Southern African Trade and Development Bank (PTA Bank) where she raised $100 million from U.S. Exim for investment in diaspora businesses. She was also an advisor to the Director General of the World Trade Organization on matters of trade, economic integration and global governance and the Rwandan Government on matters related to trade, investment and energy. She is on the Amistad Commission (commissioned by the New York State Legislature) and on the boards of Century Capital, a private equity firm in Seychelles and Prime Insurance, a Rwandan insurance company. Jacqueline has been an Adjunct Professor of Law at universities in the U.S. and Rwanda and frequently speaks at conferences and opines in the media on matters related to Africa’s economic development. She is a Young Global Leader 2011 (World Economic Forum), an Archbishop Desmond Tutu fellow 2011 (African Leadership Institute), the 2012 Mo Ibrahim Foundation Leadership Fellow, and a 2014 New Voices Fellow (Aspen Institute).